If you’re turning 65 or becoming Medicare eligible, one of your challenges is choosing a drug plan. 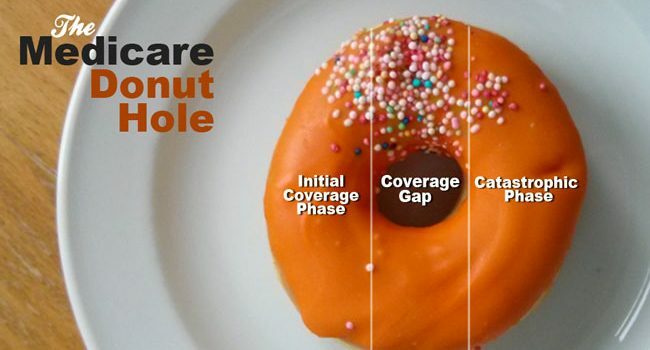 Many are confused by the term “Donut Hole” (also called the Coverage Gap). Medicare Prescription Drug Plans have four parts or phases, Initial Deductible, Initial Coverage, Donut Hole and Catastrophic. To understand the Donut Hole it’s important to understand each of these parts. The drug plan you choose in 2019 might have no deductible or a deductible as high as $415. Many drug plans have no deductible on the inexpensive generic drugs, but do have a deductible on the more expensive brand drugs. This is one way the insurance companies that market these plans control their costs and encourage their members to use generic drugs whenever possible. After the initial deductible (if there is one) is met you enter the Initial Coverage Phase. During this period you only pay a copay or a percentage of your prescription drugs. If you purchase a drug with a retail value of $100, but pay $30, the entire $100 counts toward your Initial Coverage Limit. When the retail amount you are paying for all your drugs reaches $3,820 (your Initial Coverage Limit for 2019) you have entered the Donut Hole Phase. Another way to say this is when what both you and your Part D Insurance Plan are paying for your drugs reaches $3,820 you’re in the Donut Hole. While in the Donut Hole you will pay 25% for your brand-name drugs and 37% for your generic drugs. When the total amount that you and your Part D Insurance Plan reaches $5,100 you will exit the Donut Hole and enter the Catastrophic Phase. During the Catastrophic Phase you pay the greater of 5% of retail or $3.40 for generic drugs. For all other drugs (such as brand-name medications) you pay the greater of 5% of retail or $8.50.